The Palazzo dei Vicari is the symbol of Scarperia and its history. 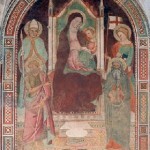 In 1306 the Florentine Republic conquered the valley of Mugello by defeating the Ubaldini family, who ruled the territory, and founded a “new land”. The town’s name was “Saint Barnabas Castle at Scarperia” and was a stronghold along the main road leading to Florence. The palace was the new town’s civil centre and it was built in the mid fourteenth century in the western side of the square, surrounded by defensive walls. Initially it was the captain’s billet, since 1415, when Scarperia became seat of a “vicario”, it became a noble palace. The building has been increased and restored over the centuries, especially after some big earthquakes (1542, 1611, 1919), but it has maintained its original structure dating from the 14th and 15th century. 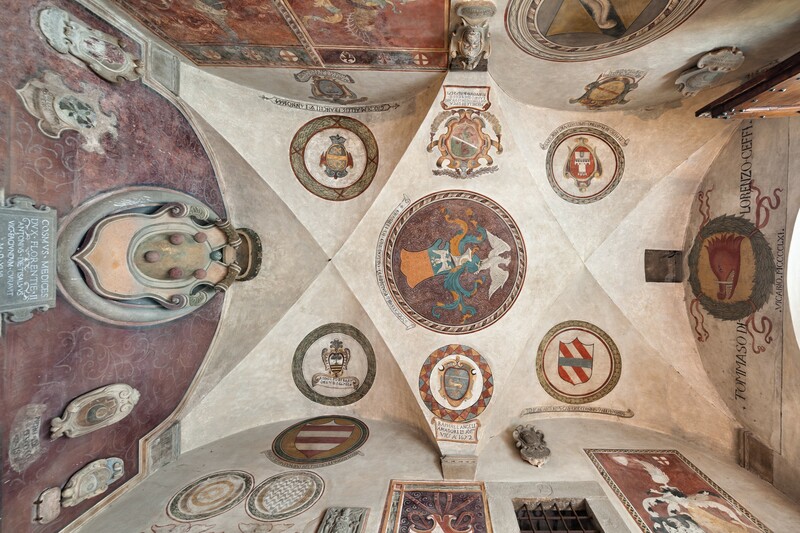 The first noticeable thing, beyond its resemblance with the architecture of Palazzo Vecchio in Florence, the model for the palace in Scarperia, is the great number of coats of arms on the façade and on the hall walls. The coats of arms belonged to the “vicari”, governors who ruled the area for six months each and who had to leave their family’s emblem in the palace. 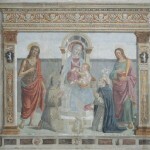 In the second hall there are some frescos from the 15th century depicting the symbols of the towns belonging to the “vicariato” and some religious representations. 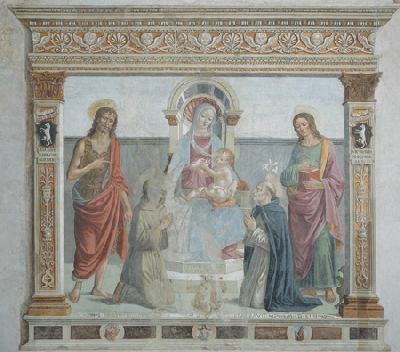 In the rooms upstairs there is, among others, a splendid fresco of the Virgin and Child with Saints, by Ghirlandaio’s school, dated 1501 and the tower clock’s mechanism, by Filippo Brunelleschi. 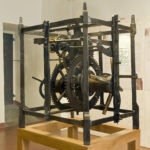 The clock is from the 1440, it is the only clockwork mechanism known made by the great artist, as well as one of the oldest public tower clocks in Italy. 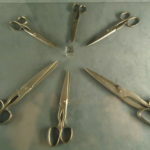 A new wing of the palace houses since 1999 the Museum of Cutting Tools, demonstration of the centuries-old activity of cutlers from Scarperia and from the rest of Italy. 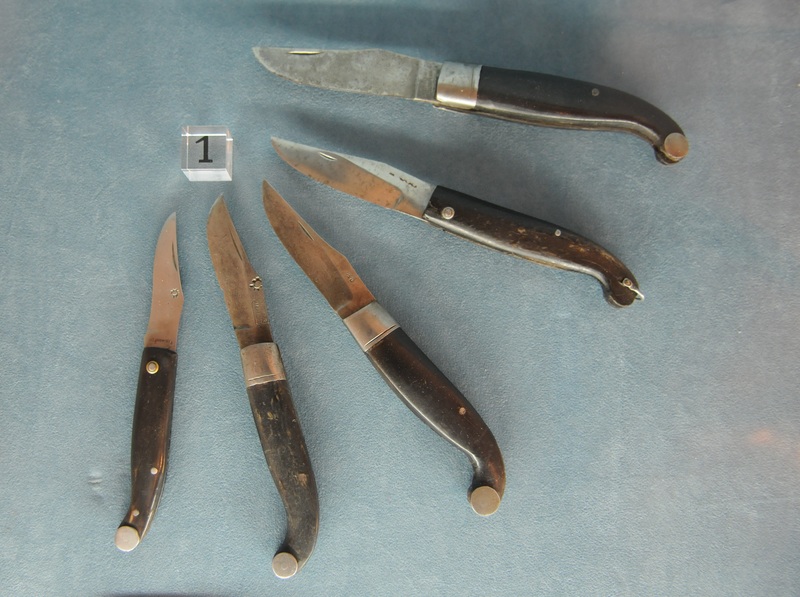 The museum is structured in five sections: one multimedia room with videos concerning the handmade manufacturing of knives, one area with Italian knives, another one with knives from Scarperia, one about the scissors and the last one about the social life of cutlers. Outside the palace there is an old cutler’s workshop (from the beginning of 20th century), still equipped with all the original tools and instruments, which one can visit on booking accompanied by the museum staff. Scarperia, la Firenze del contado. 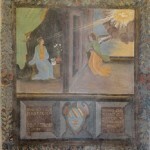 Brunori Cianti L., Lazzi G., Firenze, Editore: Polistampa, 2005. La passione di un collezionista. Scritti di Luciano Salvatici, Salvatici L., Firenze, Editore: Olimpia, stampa 2005. Scarperia 700 anni. Da “terra nuova” a vicariato del Mugello. Romby G. C., Firenze, Editore: Edifir, 2006. 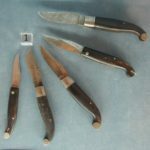 I coltelli di Scarperia, Salvatici L., Scarperia, Editore: Centro di ricerca e documentazione sull’artigianato dei ferri taglienti, 1992. Nel Vicariato di Scarperia prima e dopo Lorenzo il Magnifico. Romby G. C., Brescia, Editore: Il Cordusio Edizioni, 1992. 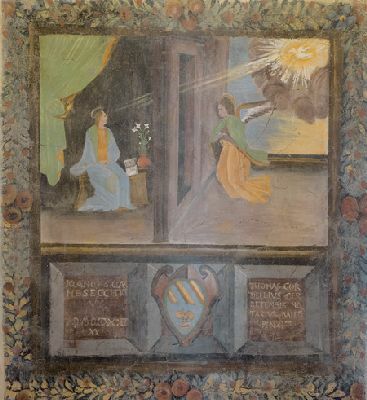 On the arch above the second flight of stairs is this fresco depicting the Annunciation, framed by a charming botanical decoration of plant shoots. Two inscriptions on its base recall with his coat-of-arms Giovanni Carnesecchi, deputy between 1620 and 1621, and Tommaso Cordelli, a notary from Cerreto who is remembered as Carnesecchi’s assistant as well as the artist of the work. 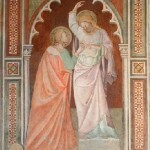 From the early Florentine 15th century, this fresco is found in the atrium of the palace,. It has been attributed to Ventura di Moro. A few years ago archive documents allowed to attribute the artefact with certainty to Filippo Brunelleschi. 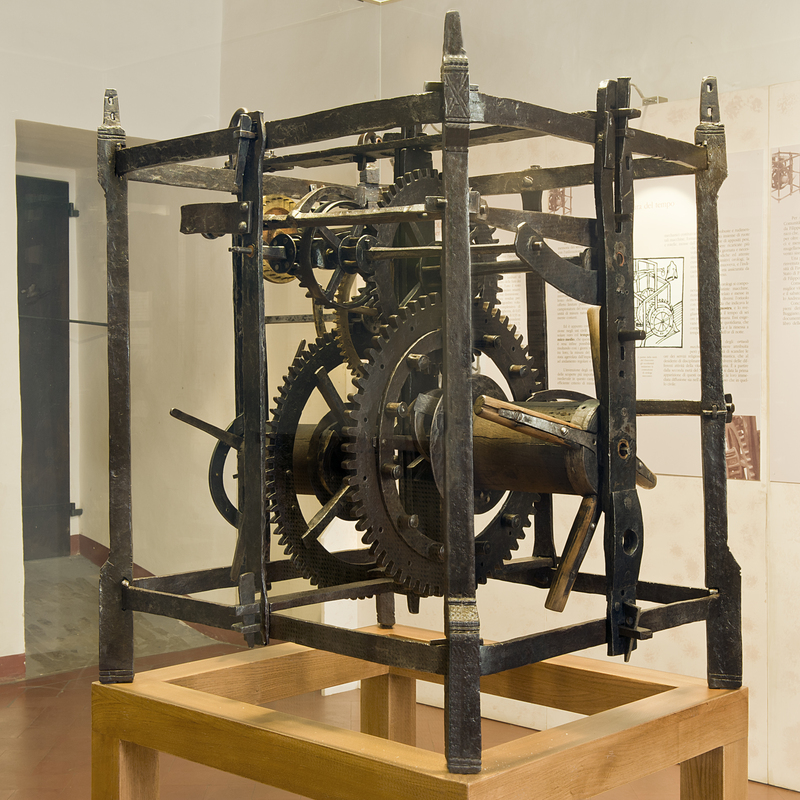 It’s the only known clock conceived by the great artist and one of the earliest tower clocks in Italy and Europe. It is structured in two parts, activated by two independent weights, but designed to work together: the mechanism to indicate the hours and the one for the ring. 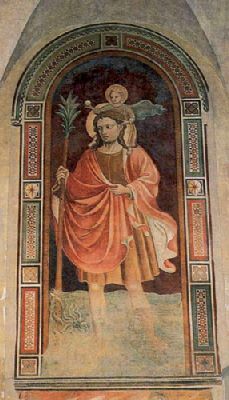 Saint Christopher is depicted according to the customary iconography of “he who carried Christ”, as passed down by the Golden Legend. 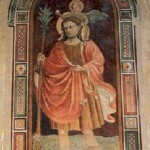 In fact, he is shown crossing a river with the little Jesus on his shoulders. he holds in his hands a flowering rod, a date palm as a sign of his encounter with Christ. 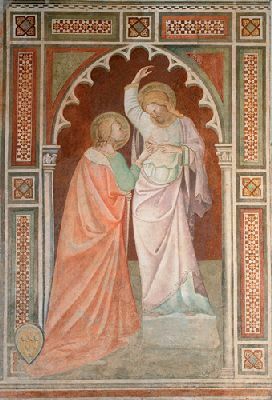 It has been attributed to Rossello di Jacopo Franchi (Florence, 1377-1456), an artist of the Orcagna school. This fresco from the early Florentine 15th century, is found in the large atrium and represents a recurring iconographic model for judges who were encouraged to see the truth for themselves before passing sentence. The name of this knife recalls his shape, without the sharpened tip. Mozzetta means indeed “cut off”. 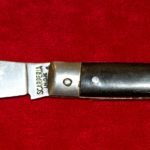 The aim was to create a knife that could cut only sideways and that was permitted even after a law from 1908 which banned blades longer than 10 cm and sharpened tips. 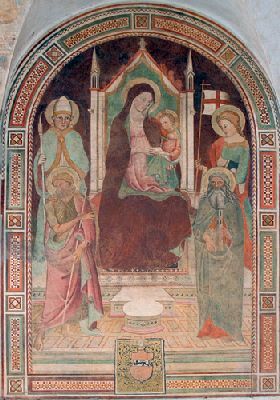 The fresco depicts the Madonna and Child enthroned, flanked by Saints John the Baptist and Francis to the left and Saints John the Evangelist and Dominic to the right. The scene has a large architectural frame in faux marble, on which a rich collection of ancient motifs unwinds, from winged heads interspersed with palmettes on the architrave to the panoplies of the pilasters with the coat-of-arms of Giovanni di Bardo di Guglielmo Altoviti, the deputy in 1501 and patron of the work. 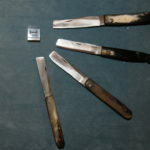 The “Zuava” is the typical knife from Scarperia, it has been produced since the end of 19th century. It’s a pocket knife, used for work, therefore it must be sturdy and light. 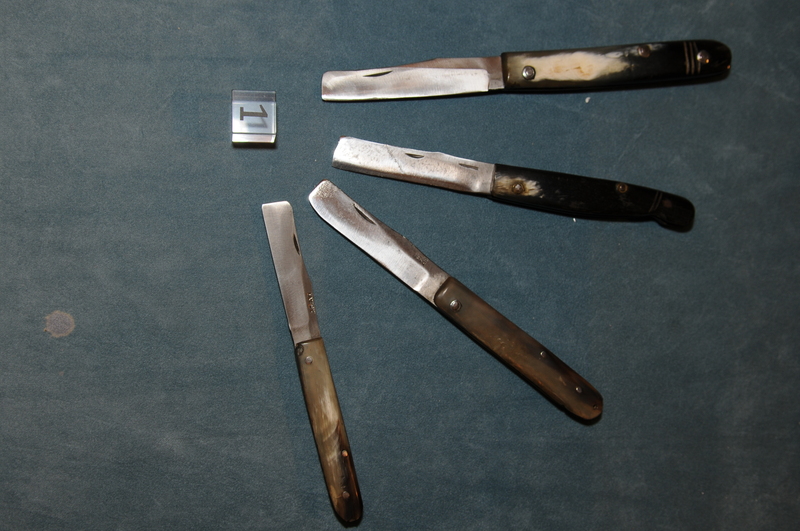 Its handle is in ox horn, the blade and spring are handmade forged. One section of the museum is about tools for weaving and sewing. 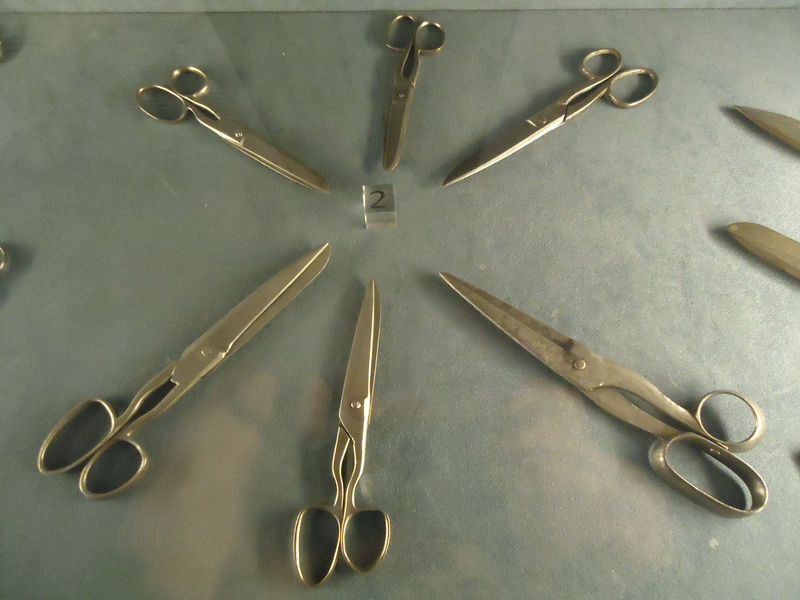 In the showcases there are different types of scissors: some are large and simple for the weavers, others are smaller and thinner for the embroiders. There are also the “chatelaines”, hung through small chains to female dresses and skirts in the 19th century. Saturdays, Sundays and holidays: 10 a.m.-1 p.m. / 3 p.m.-6.30 p.m..
from Wednesday to Sunday: 10 a.m.-1 p.m./ 3.30 p.m. – 7.30 p.m..
Open on Easter, Easter Monday, 25 April and 1 May. Upon reservation, guided visits and educational workshops for children and adults.